Friday morning was the first opportunity for many Rigans to view the 149 so-called Buddy Bears, set up on the city's central Cathedral Square. The exhibition, organized by the German embassy in Riga to congratulate Latvia on 100 years of independence, was officially launched on Thursday and is scheduled to remain in place until August 22.Latvia, a Baltic land of 2 million inhabitants, gained independence from the Russian Empire after World War I on November 18, 1918. "This is a wonderful present for our centenary," Latvian Culture Minister Dace Melbarde said. "The bears symbolize the friendship between Germany and Latvia," she said. Before a crowd of onlookers, Riga Mayor Nils Usakovs spoke of his "fantastic joy" at the popular figures from the Berlin coat of arms. 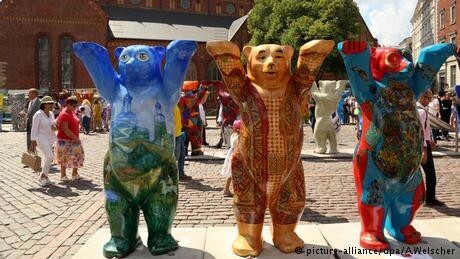 Each 50-kilogram Buddy Bear in the centre of Riga represents a country recognized by the United Nations, plus there are five special bears and one specially made Riga bear designed by a 7-year-old Latvian schoolgirl for the exhibition.